Will Obstruction of Justice in Comey Firing See Trump Ousted or Is Impeachment a “Liberal Fantasy”? | Democracy Now! award-winning British journalist and broadcaster at Al Jazeera English. He is host of the Al Jazeera interview program UpFront and a columnist for The Intercept. independent journalist who covers national security and civil liberties at the website EmptyWheel.net. 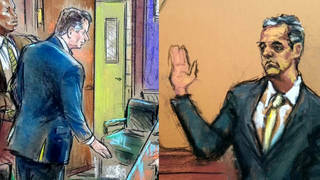 StoryAug 22, 2018Michael Cohen Pleads Guilty & Implicates Trump as Paul Manafort Is Convicted. Is Impeachment Next? AMY GOODMAN: This is Democracy Now!, democracynow.org, The War and Peace Report. I’m Amy Goodman, as we talk about the explosive testimony of fired FBI Director James Comey before the Senate Intelligence Committee yesterday. He said that President Trump tried to derail an investigation into National Security Adviser General Michael Flynn’s links to Russia, and accused Trump of lying about why he was fired. In a statement after Thursday’s hearing, Donald Trump’s personal attorney, Marc Kasowitz, rebutted James Comey’s claims that the president asked him to drop the Flynn investigation. MARC KASOWITZ: The president never, in form or substance, directed or suggested that Mr. Comey stop investigating anyone, including the president never suggested that Mr. Comey, quote, “let Flynn go,” close quote. AMY GOODMAN: For more, we continue with our roundtable with Shayana Kadidal, senior managing attorney at Center for Constitutional Rights; in Grand Rapids, Michingan, Marcy Wheeler, independent journalist who covers national security and civil liberties issues, runs EmptyWheel.net; and in Washington, D.C., Mehdi Hasan, award-winning British journalist, broadcaster at Al Jazeera English. When you hear Kasowitz, this is the personal attorney of Donald Trump, and it’s important to note that as he’s sought out personal attorneys right now, as he’s had to lawyer up, it’s been reported that four major law firms have said no to him, concerned they cannot control their client. So, Kasowitz is a lawyer from New York that he used for his real estate business. Shayana Kadidal, talk about that and the substance of what he said. SHAYANA KADIDAL: Sure. You know, I think Trump clearly needs someone who’s not just a Wall Street sort of pitbull like Kasowitz. You know, the written statement that he issued had a typographical error in the first sentence and one in every single paragraph. He misspelled “president.” You know, unfortunately, I think the large law firms that have people who really know how to do political investigation defense think Trump won’t pay them. But putting all that distractive stuff to one side, basically, what Kasowitz has said is that he thinks that, you know, Comey has leaked this information through his friend, Dan Richman in Columbia, to the press, and, you know, essentially implies that it’s protected by executive privilege, which is ridiculous on a number of grounds, right? First of all, the president let Comey testify, which means he didn’t assert executive privilege with respect to this information. The president talked about these meetings and gave his own account, really, of what happened in them, so he’s waived any privilege that exists. It’s not attorney-client privilege. It’s not national security-related. And beyond that, it’s not clear that you can use executive privilege to stop somebody who you’ve fired from talking. Executive privilege shields existing employees who don’t want to talk. When the employee wants to sing or when they’re a former employee, there’s nothing there. The reason I go into some detail on this is, basically, look, you know, one of the implications that comes out of all that is that if there are tapes, those tapes are not going to be protected by executive privilege either. SHAYANA KADIDAL: Mm-hmm, yeah. I don’t really believe there are tapes. I mean, this is a, you know, White House whose staffers seem to have trouble figuring out how to turn the lights on in conference rooms. So I think it might take a little more, you know, sophistication to be able to set that up. But if there are, they’re not going to be privileged. AMY GOODMAN: I mean, you could have a tape recorder in your pocket. SHAYANA KADIDAL: You know, you could, you know, in that very large-fitting suit that Trump always wears. But I really—you know, it’s not going to be protectable, is the bottom line, given how much has been said already about—about these conversations. AMY GOODMAN: I wanted to go to Maine Republican Senator Susan Collins, who questioned James Comey about what he did with the written notes from his January 6th meeting with Donald Trump. SEN. SUSAN COLLINS: And finally, did you show copies of your memos to anyone outside of the Department of Justice? SEN. SUSAN COLLINS: And to whom did you show copies? JAMES COMEY: I asked—president tweeted on Friday, after I got fired, that I better hope there’s not tapes. I woke up in the middle of the night on Monday night, because it didn’t dawn on me originally, that there might be corroboration for our conversation, there might be a tape. And my judgment was, I needed to get that out into the public square. And so I asked a friend of mine to share the content of the memo with a reporter. Didn’t do it for myself, for a variety of reasons, but I asked him to, because I thought that might prompt the appointment of a special counsel, and so I asked a close friend of mine to do it. AMY GOODMAN: So he asked a friend of his to do it, Marcy Wheeler. Talk about the FBI director as leaker, an admitted one. MARCY WHEELER: Well, I don’t think we should use the term “leaker,” Amy. I think we should use the term “release,” because there’s nothing—as Shayana just explained, I mean, there’s nothing about the memos that are in question here, the memos describing unclassified meetings, that prohibits these memos from being released. Comey explained them as his recording of his own memory. So, yeah, we can talk about the propriety of the FBI director using a cutout, you know, leaking to the press or providing—see, I say it, too. We all say it. But this is not somebody taking a classified document and secretly handing it off to a journalist. It’s somebody taking an unclassified memo and sharing it with the press. And so, you know, the president would like us to talk about this as leaking. It is something different. It is releasing CYA documents. AMY GOODMAN: You know, you wrote in your column, Marcy, “Kasowitz’ focus on purportedly privileged documents is all the more interesting given the pathetic conduct of Director of National Intelligence Dan Coats and NSA Director Mike Rogers at yesterday’s 702 hearing. After a great deal of obfuscation from both men about why they couldn’t answer questions about Trump’s request they intervene in the FBI’s Mike Flynn investigation, Angus King finally got Rogers to admit that he and Coats never got a conclusive answer about whether the White House was invoking privilege.” Explain what you meant. MARCY WHEELER: Yeah, the contrast between Comey and the two others. AMY GOODMAN: Talk about the FISA hearing, why that hearing was even held, the Foreign Intelligence Surveillance Act. MARCY WHEELER: Right, so, every year, in advance of—or, every time they reauthorize a major surveillance program, they have these hearings, which are basically meant to make citizens learn to love the dragnet, is what I call. I mean, it’s meant to reassure you that the men, the people running this massive surveillance infrastructure, are honorable and do what they’re supposed to do. And there were reasons to doubt that otherwise in the hearing, but in particular this, that they were—they basically made themselves out to be protectionists for the president. They were willing to, just out of a feeling of loyalty, hide embarrassing details about the president, without any—I mean, as Director Coats said, without any known legal basis to do that. AMY GOODMAN: Mehdi Hasan, I wanted to get your response to the line of questioning during Thursday’s hearing by West Virginia Democrat Joe Manchin. SEN. JOE MANCHIN: My final question will be: After the Feburary 14th meeting in the Oval Office, you mentioned that you asked Attorney General Sessions to ensure that you were never left alone with the president. Did you ever consider why Attorney General Sessions was not asked to stay in the room? SEN. JOE MANCHIN: Did you ever talk to him about it? SEN. JOE MANCHIN: You never had a discussion with Jeff Sessions on this. JAMES COMEY: No, not at all. SEN. JOE MANCHIN: On any of your meetings? SEN. JOE MANCHIN: Did he inquire? Did he show any inquiry whatsoever, what was that meeting about? JAMES COMEY: No. Oh, you’re right. I did say to him—I had forgotten this. When I talked to him and said, “You have to be between me and the president”—and that’s incredibly important, and I forget my exact words—I passed along the president’s message about the importance of aggressively pursuing leaks of classified information, which is a goal I share. And I passed that along to the attorney general. I think it was the next morning in our—in a meeting. But I did not tell him about the Flynn part. SEN. JOE MANCHIN: Do you believe this will rise to obstruction of justice? JAMES COMEY: I don’t know. That’s Bob Mueller’s job to sort that out. AMY GOODMAN: Of course, Bob Mueller is the—a special prosecutor, a special counsel, who’s been appointed. Mehdi Hasan, what he was talking about, this Valentine’s Day meeting in the Oval Office when he asked everyone to leave, including James Comey’s boss—right?—the attorney general, Jeff Sessions. The last two to leave, as described by James Comey, were Jeff Sessions—to leave the room, because they were clearing it out of a bunch of people—as well as his son-in-law, Jared Kushner. AMY GOODMAN: Talk about the significance of then him being alone with the president, something he had asked the attorney general to ensure that he never had to be. MEHDI HASAN: Well, first of all, I love the idea of being afraid to be alone in a room with Donald Trump. But just on the specific legal, constitutional, political issues, I think James Comey made it very clear in his written statement and in the testimony yesterday that this is not the done thing. You know, there is supposed to be this buffer. There is supposed to be this independent attorney general. And the problem, Amy, of course, the bigger picture, is you have Jeff Sessions as attorney general, who is a deeply compromised and partisan attorney general. He recently gave a press conference from the White House press room, which is not the done thing by attorneys general. So, there is a real issue there, that even if Jeff Sessions had been in the room, do we actually think Jeff Sessions would have done anything to protect Comey from Trump’s inappropriate requests? AMY GOODMAN: What evidence do you have of them, Mehdi Hasan? MEHDI HASAN: What evidence do I have of recordings? MEHDI HASAN: I mean, it’s been reported on by several investigative journalists, including BuzzFeed and others. And former employees have come forward and said that he had tape recordings and he was recording them. And Trump has actually intimated that he was listening in to conversations, if you go back and look at some of the earlier biographical stuff about Trump’s time as a businessman. On the obstruction of justice point specifically, I mean, Comey went out of his way, unsurprisingly, to say, “I’m not going to say whether there’s obstruction of justice,” you know, pushed it over to Mueller, his predecessor. My problem is, is that it’s going to take a lot to prove obstruction of justice, and it’s going to take a lot to, you know, produce the kind of smoking gun, before we can talk about things like impeachment. I wrote recently that it’s a liberal fantasy to talk about impeaching Trump. I stand by that. I don’t think this House of Representatives, this Republican Congress, has any interest in impeaching Donald Trump. Even if you were to produce a video of Trump talking in Russian to Putin asking for his marching orders, I suspect Paul Ryan and co. would not decide to impeach him. They’re too busy, you know, rolling back financial deregulation, passing—planning to pass huge tax cuts, putting Neil Gorsuch on the Supreme Court. They’re perfectly happy with this right-wing conservative president. AMY GOODMAN: Well, Shayana Kadidal, Paul Ryan, the House speaker, shrugged off Trump’s testimony. He said of Trump, “He’s new to government, so he probably wasn’t steeped in the long-running protocols that establish the relationships between DOJ“—the Department of Justice—”FBI and White House.” He’s just new to this. SHAYANA KADIDAL: Clearly true, but also very troubling, right? They’re infantilizing the occupant of the Oval Office, which is no place for infants. AMY GOODMAN: And clearly, he knew something, when he said, “I want to clear the room,” when he wanted to be alone, even separate from his—one of his biggest supporters, the attorney general, Sessions, who is Comey’s boss—was. SHAYANA KADIDAL: Absolutely, certainly. I mean, the circumstances, again, of what was said, rather than what was actually said about Flynn, are the damning parts, right? Along with the very firing of Comey, right? But, you know, look, one of the footnotes to yesterday is that Sessions and Loretta Lynch, both past attorney generals, came off terribly, Sessions for his political weakness and Lynch for her political interference. And it illustrates a very important, I think, larger point. AMY GOODMAN: No, explain that very quickly, though we don’t have much time. SHAYANA KADIDAL: Oh, sure. So, Lynch—Lynch basically told Comey to talk about the Clinton email investigation as a matter rather than an investigation, which Comey complied with because he knew reporters would just ignore it. But that was part of the politicized interference that made him think that the public wouldn’t have confidence in the fact that the administration of justice was done correctly, if he let Loretta Lynch announce simply that there was no criminal charges—there were no criminal charges being brought against Clinton. So that’s why he decided, in part, to announce his own conclusions in some detail, right? You know, look, in a system of separation of powers, everyone has struggled with the difficult problem of where to put the prosecuting and the investigatory function. European countries put it in the judiciary. The founders thought about it, too. You do that because you want independence from the elected officials that the FBI and Justice Department may have to investigate. But you also sometimes want a political check, right? You want to be able to—the people to vote in, and Obama, who names Eric Holder, who doesn’t enforce the drug laws in the same way, right? This tug-of-war is, you know, kind of a fundamental problem. There’s no good solution to it. Yesterday you saw something good about the independence of the FBI, and you also saw the downside throughout last year with the Clinton email scandal. Everything, I think, Comey has done through his career has been motivated by a desire to protect the independence of the FBI. But, you know, the FBI, historically, has sometimes served as a really problematic check on political dissent. We also need an FBI director who will fight that. We’ve never had it. AMY GOODMAN: We’re going to leave it there. I want to thank you all for your input. Marcy Wheeler of EmptyWheel.net, speaking to us from Grand Rapids, Michigan. Mehdi Hasan of Al Jazeera English, host of the program UpFront, also an Intercept columnist. And thanks so much to Shayana Kadidal of the Center for Constitutional Rights. I’ll be speaking Saturday in Chicago, 9:30, McCormick Place for the People’s Summit. On Sunday, I’ll give the keynote address at the New York City Green Festival, 1:00 p.m., Javits Convention Center.